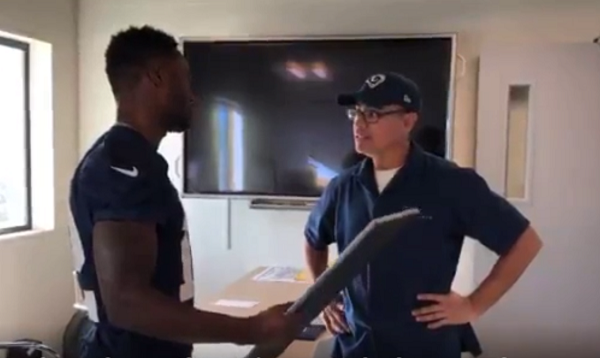 Facility Worker Nervous When NFL Team Calls Him Into Office, Then Gets Incredible Surprise Gift. 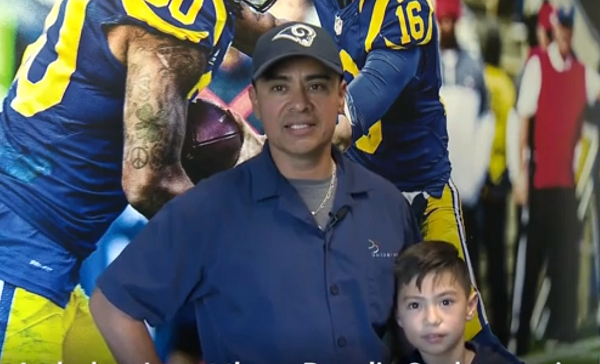 As a facility worker for the Los Angeles Rams, Alfonso Garcia is used to blending into the background. Public focus is always on the players and the franchise, but like any good team players, the Rams organization recognizes that every person who works to support the team is important. 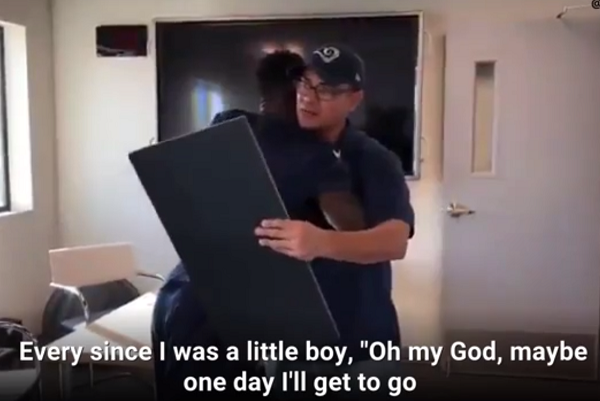 In a video that’s going viral online, we get to see Rams wide receiver Brandin Cooks not only recognizing Alfonso’s hard work for the team, but give him one of the most incredible gifts a sports fan could hope to receive. Alfonso soon learned that he wasn’t in trouble at all. 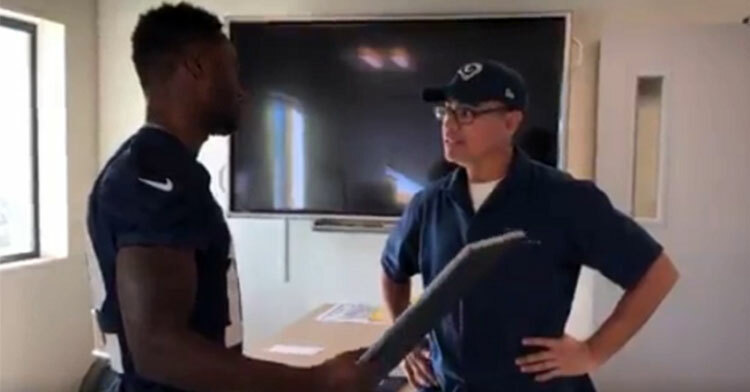 In fact, he was about to be rewarded for keeping the Rams facility in “tip-top shape.” Inside the office stood Brandin Cooks, who was holding a gift for Alfonso. 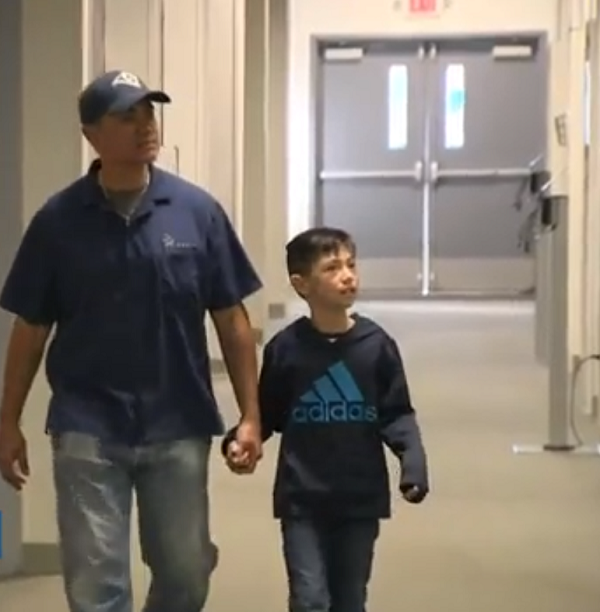 Fighting back tears, Alfonso couldn’t wait to share the news with his son, Joshua, who is a huge NFL fan. “It takes a team to achieve the dream,” the Rams tweeted. Way to go, L.A. Rams! 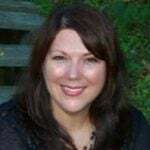 No matter who wins Super Bowl LIII we will always respect this team for honoring the little guys who keep the trains running on time. We hope Alfonso and Joshua have a fabulous time watching the Rams play the New England Patriots! Watch Alfonso receiving this incredible gift in the video below, and be sure to share.